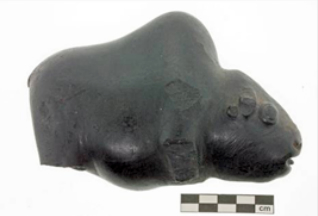 Early indigenous people transform coal found in seams in foothills and mountain regions into effigies. Most of the effigies depict bison, usually cows, with tongues out, indicating either running or being in labour. The specimens have all suffered damage from ploughing but are still remarkable and accurate anatomical reproductions of bison. The presence of coal in Alberta is first recorded by a European explorer. 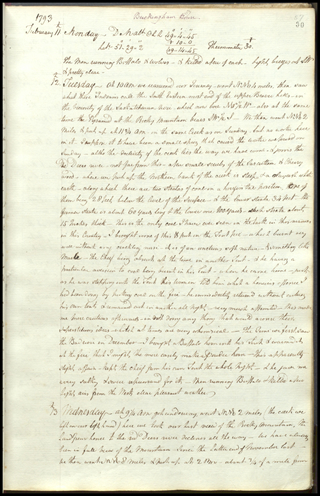 In the February 12, 1793, entry of “Journal of a Journey over Land from Buckingham House to the Rocky Mountains in 1792 & 3 by Peter Fidler,” Fidler describes his coal discovery. 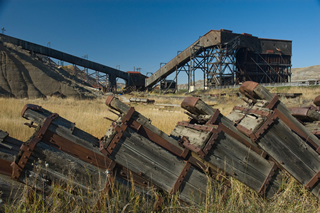 The first commercial coal mine begins operation near present-day Lethbridge, Alberta. The first large-scale commercial mine begins production in Alberta. The entrance to Galt Drift Mine No. 1 in 1885 near present-day Lethbridge; Sir Alexander Galt establishes the mine to exploit the region’s abundant coal deposits. Galt also establishes the North Western Coal and Navigation Company in the same year to supply coal to the Canadian Pacific Railway. Coal mining begins in the Crowsnest Pass region of Alberta. 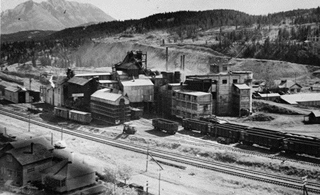 A view of International Coal and Coke Company at Coleman in the Crowsnest Pass, ca. 1912, eleven years after production started; the region yields a high volume of industrial steam coal. Coal Branch mines open southwest of Edson, Alberta. 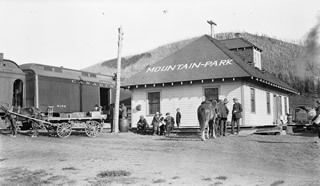 Mountain Park Station, Mountain Park, Alberta, ca. 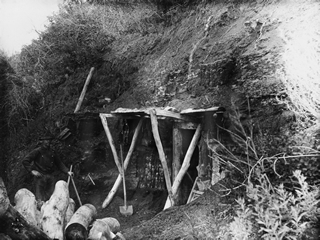 1920-1923; small-scale mining had begun in the Coal Branch about 1909, but after 1910 the arrival of the railway opened up the region to large-scale mining. Mountain Park appears to have been the first major community to grow, reaching a population of about 330 by the early 1920s. First large commercial mine in Drumheller starts production. 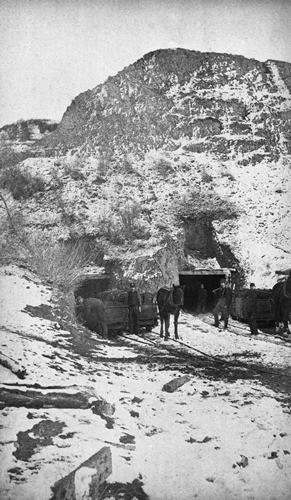 Horses pull coal-filled wooden mine cars underground at Newcastle Mine in 1914, three years after Newcastle opened in Drumheller. Alberta’s deadliest coal mine disaster occurs at Hillcrest, Alberta. An initial gas explosion triggers a larger coal dust explosion, killing 189 miners. 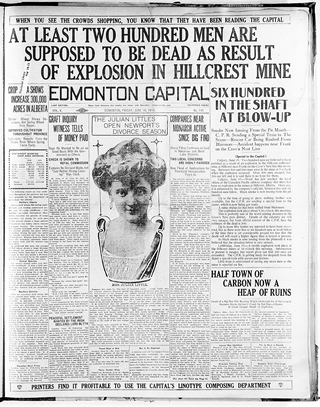 The initial fatalities estimate reported in the Edmonton Capital newspaper on June 19, 1914, was later revised. Cost of living rises by 65% since onset of World War I in 1914, contributing to coal industry labour unrest and heightened union activity. 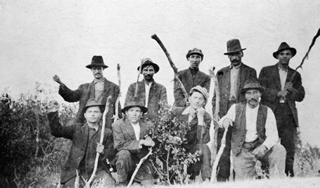 Strikers from the One Big Union (OBU) at Drumheller, Alberta, in 1919; the union forms after labour workers broke away from the United Mine Workers Association union. Miners are drawn to the OBU because of the deepening economic crisis. The province is divided into thirty-two coal mining districts as the industry expands broadly. 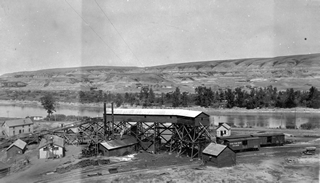 Newcastle Mine in the Drumheller mining district after ten years of expansion, 1921; Drumheller is one of thirty-two districts created to facilitate keeping track of the booming industry’s developments, inspections and infrastructure requirements. The Second World War begins to revive Alberta’s economy and coal industry, which had declined during the Great Depression. 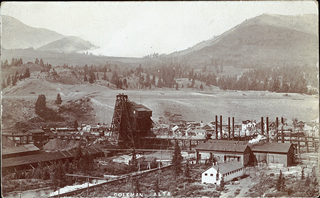 A view of the booming International Coal and Coke Company Ltd. at Coleman, ca. 1945; increased demand for steam coal during the war years led to greater production within the industry. The discovery of a major oil deposit at Leduc, Alberta, foreshadows a decline in the province’s coal production. 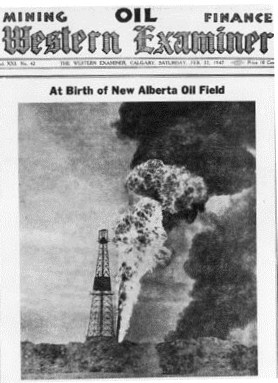 On February 22, 1947, an issue of The Western Examiner proclaims the discovery of the Imperial Leduc No.1 oil well as the birth of a new Alberta oil field. During the decade after the 1947 discovery, many mines close, and most coal towns decline significantly. Large-scale surface mining begins in Alberta near Lake Wabamun to fuel a large thermal electric power plant. A heavy-duty truck hauling coal at the Wabamun surface mining operation near the TransAlta Power Plant demonstrates the advanced mechanization propelling Alberta’s modernizing coal industry in the 1960s. The last mine in Edmonton’s river valley closes. 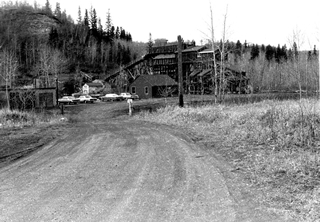 The Whitemud Creek Mine in Edmonton’s river valley in 1968; this operation is the last of Edmonton’s coal mines to close in 1970. 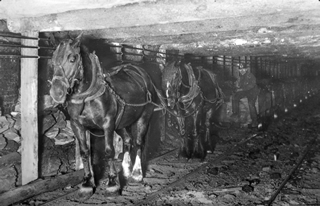 At this time, the mine continues to rely on horses to haul coal to its opening. Drumheller Valley and Canmore mines close after decades in operation. The Atlas Mine in Drumheller stops production in 1979 and officially closes in 1984. The large structure is the last wooden tipple standing in Canada. The mine is a Provincial Historic Resource, a National Historic Site of Canada and one of the region’s star attractions. Mining near Forestburg ends after more than seventy years. 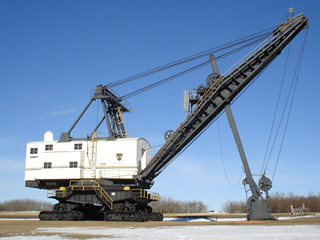 The retired Marion 360 Stripping Shovel at the Diplomat Mine site near Forestburg, Alberta; the interpretive site is a Provincial Historic Resource and Canada’s only surface coal mining museum. The kind of large-scale surface mining conducted near Forestburg requires massive equipment such as the Marion 360. Wabamun coal-fired power plant is retired and demolished after almost fifty years in operation. 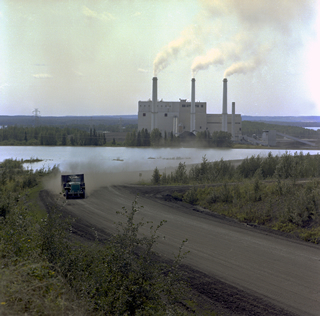 The Wabamun power plant in the final stages before destruction; it had begun generating electricity in 1962 by burning coal mined at large-scale surface operations near Wabamun Lake. The planned closure of the plant is featured in an Edmonton Journal article on April 2, 2010. “Alberta, Canada.” Ghost Towns. http://www.ghosttowns.com/canada/alberta/alberta.html (accessed May 8, 2013). Andreae, Christopher and Geoffrey Matthews. Lines of Country: An Atlas of Railway and Waterway History in Canada. Erin, ON: The Boston Mills Press, 1997. Atlas Coal Mine: Historical Research Project. Prepared by Waskasoo Design Group Ltd. For Atlas Coal Mine Historical Society, Drumheller, AB, 1994. Atlas Coal Mine National Historic Site. http://www.atlascoalmine.ab.ca/ (accessed March 28, 2013). Atlas of Alberta Railways. University of Alberta Press. 2005. http://railways.library.ualberta.ca/ (accessed December 12, 2013). Baldwin, Correy. “From Coal-crowned to Ghost Town: The Life and Death of Alberta’s Coal Branch.” CIM Magazine (March/April 2013). https://magazine.cim.org/en/2013/March-April/mining-lore/Alberta-Coal-Branch.aspx. Belliveau, Anne. Small Moments in Time: The Story of Alberta’s Big West Country. Calgary: Detselig	Enterprises Ltd., 1999. BP Statistical Review of World Energy June 2010. http://www.bp.com/statisticalreview (accessed December 10, 2012). Canadian War Orders and Regulations. Vol. 2, Statutory Orders and Regulations Division Privy Council Office. Ottawa: Edmond Cloutier, Printer to the King’s Most Excellent Majesty, 1943. Caragata, Warren. Alberta Labour: A Heritage Untold. Toronto: James Lorimer & Company,	Publishers, 1979. Chambers, Allan. Spirit of the Crowsnest: The story of unions in the coal towns of the Crowsnest Pass. Edmonton: Alberta Federation of Labour and the Alberta Labour History Institute, 2009. Chrismas, Lawrence. Alberta Miners: A Tribute. Calgary: Cambria Publishing, 1993. “Coal.” Alberta Energy. Government of Alberta. http://www.energy.alberta.ca/coal/coal.asp (January 22, 2013 and May 14, 2013). “Coal Basics.” Coal Association of Canada. http://www.coal.ca/coal-basics/ (accessed May 27, 2013). “Coal Mining.” World Coal Association. http://www.worldcoal.org/coal/coal-mining/ (accessed December 10, 2012). Cooper, Dave. 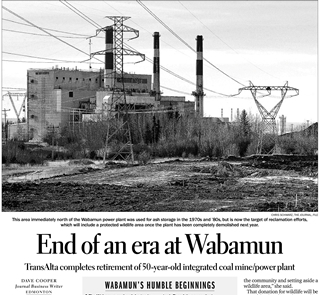 “End of an Era at Wabamun.” Edmonton Journal. Apr. 2, 2010. Craats, Rennay. The Blacksmith. Calgary: Weigl Publishers, 2004. Culbertson, Debbie and Heather Marshall. Candles to Kilowatts: The Story of Edmonton’s Power Company. Edmonton: Duval House Publishing, 2002. Dempsey, Hugh A, ed. The CPR West: The Iron Road and the Making of a Nation. Vancouver: Dougals & McIntyre, 1984. Dictionary of Canadian Biography. University of Toronto/Université Laval. http://www.biographi.ca/index-e.html. “Diplomat Mine Site.” Canada’s Historic Places. http://www.historicplaces.ca/en/rep-reg/place-lieu.aspx?id=7985 (accessed May 8, 2013). The Hills of Home: Drumheller Valley. Calgary: Drumheller Valley History Association, 1973. Fidler, Peter. Southern Alberta Bicentennial: A Look at Peter Fidler’s Journal : Journal of a Journey over Land from Buckingham House to the Rocky Mountains in 1792 & 3. 2nd ed. Edited by Bruce Haig. Lethbridge: Historical Research Centre, 1991. Francis, R. Douglas and Chris Kitzan, eds. The Prairie West as Promised Land. Calgary: University of Calgary Press, 2007. Francis, R. Douglas, Richard Jones and Donald B. Smith. Destinies: Canadian History Since Confederation, 4th ed. Scarborough, ON: Nelson Thomson Learning, 2000. Freese, Barbara. Coal: A Human History. Cambridge: Perseus Publishing, 2003. Galloway, Robert Lindsay. Annals of Coal Mining and the Coal Trade. Vol. 1. London: The Colliery Guardian Company, Ltd, 1898. Reprinted with a new introduction and bibliography by Baron F. Duckham. Newton Abbot, UK: David and Charles Ltd., 1971. Hatcher, John. The History of the British Coal Industry. Vol. 1, Before 1700. Oxford: Clarendon Press, 1993. Hawkins, W.E. Electrifying Calgary: A Century of Public & Private Power. Calgary: The University of Calgary Press, 1987. Hlady, Ernest. The Valley of the Dinosaurs, Its Families, and Coal Mines. Drumheller: East Coulee Community Association, 1988. Johnston, Alex. Lethbridge, From Coal Town to Commercial Centre: A Business History. Lethbridge: Lethbridge Historical Society, 1997. Johnston, Alex, Keith G. Gladwyn and L. Gregory Ellis. Lethbridge, Its Coal Industry. Lethbridge: Lethbridge Historical Society, 1989. Kalman, Bobbie. The Blacksmith. New York: Crabtree Publishing, 2002. Kelly, Erica and Richard Kissel. Evolving Planet: Four Billion Years of Life on Earth. New York: Abrams	Books, 2008. Koch, John. Martin Nordegg: The Uncommon Immigrant. Edmonton: Brightest Pebble Publishing	Co.	Ltd, 1997. MacGregor, J.G. Canada’s Forgotten Surveyor: Peter Fidler. Toronto: McClelland and Stewart	Limited, 1966. McCloskey Productions. Thunder in the Valley. Produced for Historic Atlas Coal Mine in Drumheller Valley, Alberta, 1997. McGeehon, Priscilla, ed. Civilization: Past & Present. 9th ed. New York: Addison Wesley Educational Publishers Inc., 2000. McIntosh, Robert G. and Delphin A. Muise. Coal Mining in Canada: A Historical and Comparative Overview. Transformation Series 5. Ottawa: National Museum of Science and Technology, 1996. “Mines in Operation.” TransAlta. June 13, 2012. http://www.transalta.com/facilities/mines-operation (accessed May 14, 2013). Nordegg, Martin. The Possibilities of Canada Are Truly Great: Memoirs 1906-1924. Toronto: MacMillan of Canada, 1971. Palmer, Howard and Tamara Palmer. Alberta: A New History. Edmonton: Hurtig Publishers Ltd, 1990. Penner, Vicky. Only in Nordegg: Musings of One Young Resident: Life in a Town That Became a Ghost Town. Calgary: Blitzprint, 2007. Ross, Toni. Oh! The Coal Branch: A Chronicle of the Alberta Coal Branch. Calgary: D. W. Friesen and Sons Ltd., 1988. The Royal Tyrell Museum of Paleontology. The Land Before Us: The Making of Ancient Alberta. Red Deer, AB: Red Deer College Press, 1994. Ruggles, Richard I. A Country So Interesting: The Hudson’s Bay Company and Two Centuries of Mapping 1670 – 1870. Montreal: McGill-Queens’ University Press, 1991. Speight, James G. The Chemistry and Technology of Coal. 3rd ed. Boca Raton, FL: CRC Press, 2013. “Water.” Environment and Sustainable Resource Development. Government of Alberta. http://environment.alberta.ca/02645.html (accessed May 22, 2013). When Coal was King: Coal Mining in Western Canada. Heritage Community Foundation. http://wayback.archive-it.org/2217/20101208160312/www.coalking.ca/ (archived December 8, 2010). Wylie, William Newman Thomas. “Coal-Mining Landscapes: Commemorating Coal Mining in Alberta and Southeastern British Columbia,” a report prepared for the Historic Sites and Monuments Board of Canada, Parks Canada Agency, 2001. Yinke, Deng. Ancient Chinese Inventions. New York: Cambridge University Press, 2011.